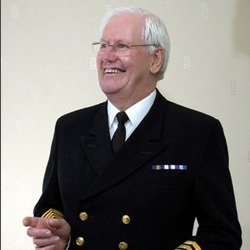 Captain William Wells, Master Mariner, a former ship’s captain and commercial marine pilot, with a career at sea lasting just short of 49 years. Recognised as an international informative and entertaining “Topic-Expert” speaker, I was an active member of the Professional Speakers Association, Member of the International Federation of Public Speakers and a former Vice President of Toastmasters International. I have a wide ranging programme and speak regularly at conferences, seminars, after dinner and after lunch to a wide variety of different learned societies and organisations including the prestigious Bewdley Festival, BBC Radio, both local and national, as well as on board cruise ships. All with great passion, enthusiasm and authority. Speaking in my full Captain’s uniform, all my talks are delivered in an entertaining and informative way having proven successful for all audiences of all ages. The majority of my lectures and presentations are supported by state-of-the-art digital power-point for which I supply everything needed with the exception of a screen or use of a blank wall and a table for my projector and laptop. All talks are informative, entertaining, humorous and given in a light hearted manner, suitable for both sexes and all ages. If required, several of my talks can be delivered as a ‘stand alone’ presentation. I charge from £150.00 plus travel at cost and overnight accommodation when necessary. This fee includes the provision of all my own state of the art digital AV equipment with the exception of a screen. The fee is often reduced by any sales of the 2nd edition of my published autobiography titled: A Sailor’s Tales for which signed copies retail at £10.00 and 20% of all sales are refunded to the client on the day. This talk takes a comprehensive look at the man himself; the real person behind his portraits and embellished history. From his birth and early upbringing, limited formal education and throughout his career in the British Royal Navy, as well as the issues, conditions and circumstances that moulded him to stand out from other men as a leader without peer. The talk also discusses his personal weaknesses in particular regard to Lady Emma Hamilton and his sometimes volatile relationship with their Lordships at the Admiralty. Starting in the year 43AD before London was settled, we trace back to why this particular site was chosen to be the Roman colony’s new capital city. Looking through the various stages of development, invaders, wars, famine, plague and fire, we follow the history and heritage of London and its Port to that which we know today. The World Heritage site known as “Maritime Greenwich”, its architecture and influence on the overall area of Maritime London is also discussed. In this specially prepared talk to celebrate 500 years of having been granted a Royal Charter by King Henry VIII in 1514, we look at the history of and the reasons why Trinity House, one of the world’s renowned maritime organisations was formed in the late 15th century. The power of the House and its influence on the international maritime world throughout the centuries until major political changes were forced upon it in 1988 are discussed in detail. We also look at the roles of Trinity House in today’s international maritime world and take a pictorial tour through the House itself. A popular, entertaining and informative talk traces maritime pilotage from the Phoenician times to today’s modern world of computers and satellite navigation. Going behind the “green baize door” leading to the ship’s bridge and nerve centre, we take a look behind the scenes on how a ship, be it a small tramp freighter or a colossal cruise liner, is handled and docked. This talk is interspersed with many humorous personal anecdotes. Commissioned by the London Tourist Board, this is the story of England’s most important waterway – The River Thames. It has been said that the great St. Lawrence River is pure liquid, the Mississippi is muddy liquid, but London’s River Thames is liquid history. Form source to sea, we view its bridges, weirs, locks, islands, ferries, tunnels, docks and tides. We look at its strategic importance as well as some of the exciting and tragic events which have taken place there. We see how the River has been used by royalty and commoners, politicians and sailors and why it is known as ‘Liquid History’. By popular request this talk comprises the first half of “History & Heritage of Maritime London” and the second half of “Life & Times of a Ship’s Pilot”, thus covering the main aspects of both talks. This is an entertaining but serious look at the many myths and legends of the Bermuda Triangle. (A very popular talk aboard cruise ships, especially when in the area itself!) We examine why and when this area was designated the Bermuda Triangle. We also look at what may have caused its reputation including the infamous Flight 19 and many other strange and inexplicable happenings to both ships and aircraft. This talk which is suitable for all audiences, examines the Atlantic Ocean which covers 20% of the earth’s surface, the topography of its sea-floor and what dwells down there. The marine food chain and the devastating effects of modern bottom trawling, as well as the abyssal plain, ocean trenches and ridges, black smokers and underwater volcanoes are also discussed. Like the talk on the Atlantic Ocean, this talk examines the Pacific Ocean and especially its incredible depths. Norway has produced many famous intrepid explorers and adventurers down through the years, none more so than Thor Heyerdahl whose epic journey across the Pacific Ocean on an open raft in 1947 caught the world’s imagination. This lecture covers not only the man himself but contains the story of this voyage “The Kon-Tiki Expedition” which lasted 101 days during which 6 men covered over 4,300 miles on an open raft made up from balsa tree trunks and measuring roughly 45ft by 18ft; all of which were held together by 1¼ inch hemp rope. Three further sea expeditions are also discussed: Ra, Ra2 and Tigris. It was during the Tigris expedition in 1978, when the reed built raft was forced into Bahrain for emergency repairs, that the speaker had the opportunity to meet Thor Heyerdahl in person and discuss many of his travels. Two of London’s, if not the world’s most iconic landmarks, are discussed in this talk commissioned by the London Tourist Board. The Tower of London, built by William the Conqueror in the 11th century, became a battle fortress and a place of horror. With its macabre history of torture and executions, the incarceration of Queens and nobles, housing the Crown Jewels and even a menagerie, it remains one of the most historically important buildings in London. Tower Bridge, adjacent to the Tower of London was, when completed in 1894, the largest and most sophisticated bascule bridge in Europe. We look at its history and construction as well as many of the ‘out of the ordinary’ events that have taken place there. This talk traces the history and travels of the Vikings as they made their way eastwards, southwards and westwards from Scandinavia, ransacking, conquering and settling in the lands as they went. Particular study is given to the Norwegian Vikings as they slowly made their way westwards finally settling for a short period in North America. For corporate clients who wish to look at a different approach to “man-management and leadership” by using the 5 core principles that worked so well for Admiral Lord Nelson over 200 years ago and which are still relevant in today’s modern world. These methods have been copied and are in use today in both the corporate world as well military academies throughout the world. This is an informative, amusing and entertaining After Dinner/Lunch speech, where, with a modicum of literary licence and under guidance, the audience is allowed to take command of a large cruise liner up the River Thames, through the Thames Barrier and finally berth her at Greenwich. In spite of being internationally renowned as a Public Speaker, Captain William Wells also works as a volunteer for the national charity CATS PROTECTION, and offers an interesting talk (optionally illustrated) giving an insight into the history and development of the domestic cat and the work of Cats Protection, both at the national level and of his local Northampton Branch. Fees for this talk is a donation to CATS PROTECTION.